There's a video going around the Internet of a supposèd arrest by military men of a G20 protester. On the one hand you have people like Alex Jones claiming this is evidence of the coming marshal law that they've been claiming is just around the corner for 20-25 years. On the other you have other people claiming it's a hoax - that is to say some kind of performance art piece. The boots aren't standard - while two are wearing military-style boots, the other is wearing brown work boots. The uniform styles are outdated and are no longer used. The car has a Pennsylvania license plate, not a US Government plate. According to one protester: The ID tags had Pittsburgh Department of Public Safety on them and a long ID number. Even on Infowars many of those guys point out things wrong with the video. You can see the same three guys hanging around cops and the same car. Some people watching the videos think it's illegal for non-military to wear BDUs, but that's hardly the case - ever been to a military surplus store? It's actually illegal to wear any sort of rank, insignia, and so forth. US Code Title 10, Chapter 45 does seem to state that it's illegal - even wearing a military cap, but the purpose of the law is actually to keep individuals from impersonating military personnel. I guess I sort of contradict myself there, but have you ever heard of anyone being arrested for simply wearing BDUs? There's a reason Tupac called cops "troops" anyway. 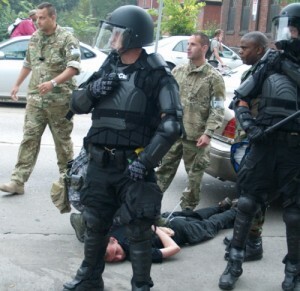 The individuals involved in the 9/24/2009 arrest which has appeared online are law enforcement officers from a multi-agency tactical response team assigned to the security operations for the G20. It is not unusual for tactical team members to wear camouflaged fatigues. The type of fatigues the officers wear designates their unit affiliation. Prior to the arrest, the officers observed this subject vandalizing a local business. Due to the hostile nature of the crowd, officer safety and the safety of the person under arrest, the subject was immediately removed from the area. Why does it matter if they're all lying and it was really super-unorganized, protocol breaking, badly uniformed military personnel? During the days of COINTELPRO, the police had no problem cooperating with the FBI to have people killed or to beat up people in the streets. Why is it different now if it's the same evil people in charge? Why do they need to use the military when they've shown they can brutally do whatever they want without it? Is it because the so-called "patriot movement" with people like Alex Jones seem to believe States can do no wrong and only the Federal government is evil? When's marshal law coming? Still just around the corner. I have a feeling I'll be asking this question for the next several years, and even then, it'll be just around the corner. If they didn't do it after 9/11, why are they going to do it now?